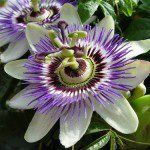 According to the University of Maryland Medical Center, passionflower is an herb used for anxiety, insomnia, seizures and hysteria. This herb works by increasing levels of GABA (gamma aminobutyric acid) in the brain which limits overactive brain cells giving a therapeutic response of relaxation. This herb has many possible drug interactions and should be consulted with a physician prior use. Possible interactions include, sedative drugs such as barbiturates, benzodiazepines and insomia medications because passionflower can enhance the effect of these medications which can result in coma or severe respiratory depression (umm.edu). Other drugs that can interact include, blood thinners because according to University of Maryland, taking passionflower with blood thinners will increase your ability to bleed. “Passionflower.” University of Maryland Medical Center. N.p., n.d. Web. 09 July 2012..
Meininger, Kathryn. “Uses of Passion Flower.” LIVESTRONG.COM. N.p., 28 Mar. 2011. Web. 09 July 2012..